POT OF PICKLES Cucumbers, brine and little help from ‘Lactobacillus’ bacteria are all it takesto make your own pickles. Pickling season is upon us. Summer's bounty will soon become soggy unless you it all eat quickly, or turn to pickling. I advocate both. How you eat them is up to you, but I'll offer some advice on pickling. Lactobacillus bacteria to do the work for you. Lactobacillus consumes the sugars found in vegetables and fruits (technically, cukes are fruit) and converts them into lactic acid, which creates a hostile environment for harmful bacteria and fungi. Plus, fermented foods offer healthful, probiotic benefits for your gut. You can ferment just about any firm vegetable (peppers, onions, carrots, beets, asparagus, turnips), but you can't beat good ol' pickled cucumbers; i.e., pickles. Wash the cukes and slice into quarters. Peel and smash the garlic. 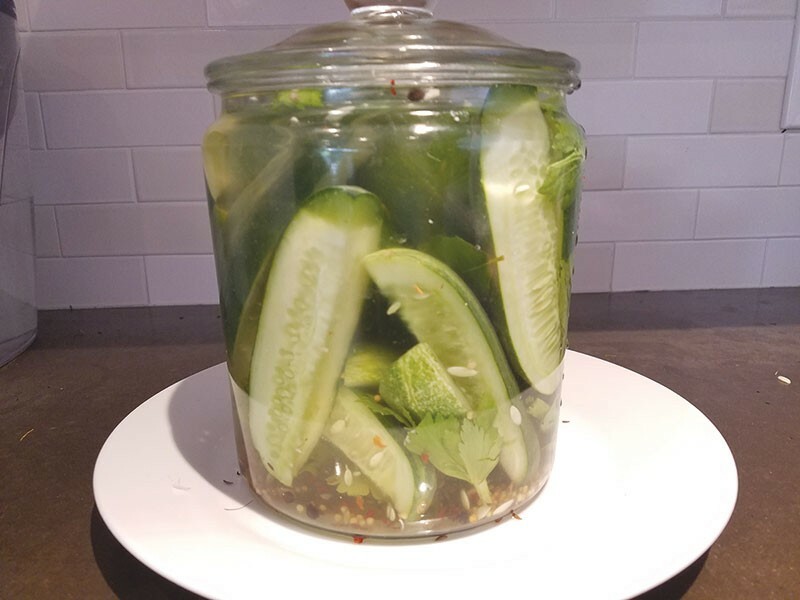 Pour water (preferably filtered or chlorine-free) into a half-gallon glass jar big enough to hold the cucumbers with room for one or two inches of brine above the pickles-to-be. Add salt and mix to dissolve, then add the garlic, spices and oak leaves. Place the cucumbers in vertical stacks so they stand up. You can fit more in this way, pushing additional cucumbers into the gaps. Make sure the vegetables are completely submerged in the brine. Cover with a cloth or loosely fitted lid and set out on your counter. After a few days, bubbles will start to form. That's fermentation! After a week or so, taste a pickle to see if it's to your liking. The longer it goes, the more sour the taste. Two weeks is probably long enough. Once done, cover tightly and store in the refrigerator. Mine last a month or more before they start to get a bit soggy—but they usually get eaten up well before that.